Anushka Sharma has been slammed by certain wannabe trollers on social media several times every time Virat Kohli lost the match. 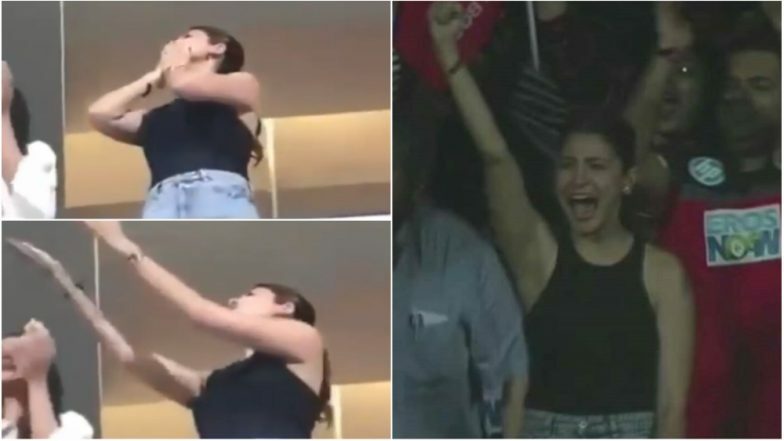 However, not giving a tiny rat's a** to such trolls, Anushka Sharma went to the M Chinnaswamy Stadium in Bangalore to support her husband Virat Kohli and guess what? Virat and his team Royal Challengers Bangalore (RCB) won the match. Anushka looked pretty excited as she cheered for Virat while he continued to score last night. In fact, she blew flying kisses to Virat when RCB won the match last night! The internet is flooded with videos of Anushka blowing kisses to Virat and we just can't contain our excitement after watching these videos. For those who missed out on the epic match last night, this was RCB's first home game and AB de Villiers as expected put up the fireworks for the fans which led to RCB’s victory against the KXIP. AB’s innings of 57 off 40 balls, comprised a couple of 4s and 4 sixes. Right from the start, the game was in favor of RCB as they won the toss and invited the guests to bat. Initially, it looked like Mayank Agarwal and KL Rahul would build a strong opening partnership. But, Umesh Yadav got rid of the Agarwal. Aaron Finch followed Agarwal to the pavilion the very next ball. KXIP’s most reliable batsman Yuvraj Singh too got knocked off when Umesh Yadav bowled a quick delivery. On the work front, Anushka Sharma's last film Pari was a successful stint at the box office. She is currently prepping for Aanand L Rai's Zero which also stars Shah Rukh Khan and Katrina Kaif.